The hero's quest for the extraordinary, a recurring theme in literature, reflects the urge of every heart at its noblest to discover the full possibilities of life. Anyone dissatisfied with the scant potential of mundane existence is naturally stimulated by the prospect of finding, even vicariously, a world of greater liberty. There should be some better place for the soul. Why should happiness be so elusive, and why should confusion and resentment always shroud the mind's eye, making it unable to clearly see what is in front of it? 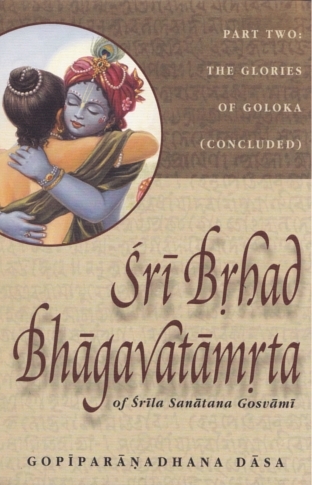 Srila Sanatana Goswami's Brihad-bhagavatamrita, written in Sanskrit nearly five hundred years ago, is a gemlike example of the quest genre, but different from the sort commonly encountered in fable and fiction. Narada and Gopa-kumara, the respective heroes of this book's two parts, are searching for a key to fulfillment much subtler than wealth, influence, mundane love, the Fountain of Youth, or even the Holy Grail. Narada has vast experience of the cosmos; Gopa-kumara is illiterate and naive; yet they share the same vision of what is most valuable. What both want is not to conquer or exploit on any level, but to explore the mystery of selfless service. As Narada already knows, and Gopa-kumara will gradually learn, the superior mode of life they seek is personal and defined by the interplay of those who take part in it, rather than by the material laws of nature. Gopiparanadhana Dasa's English prose version reads clearly and crisply. Moreover, it conveys the excitement, wonder, and devotion of spiritual discovery that animates Sanatana's own composition. The more I read, the more fascinated I became. The further I read, the less was I conscious that I was reading a translation, so naturally does one unit of the narrative flow into the next. When I did shift to the task of comparing portions of the translation with the Sanskrit, I was pleased to discover that the English prose is indeed very faithful to the Sanskrit original.